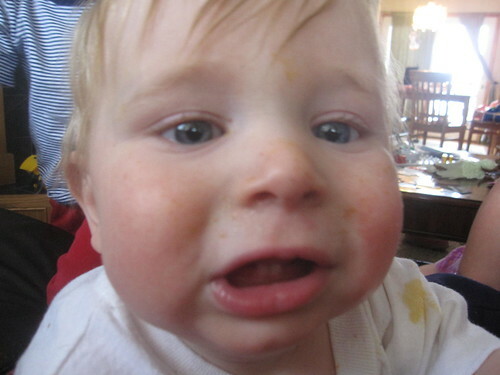 This winter has been really hard on our infant son, as he’s come down with a series of colds. It seems as though as soon as he has one licked, he has maybe a week of good health, then he’s fallen with another one. This week, he was fairly ill again and Sarah and I spent three days being his nurse. On the last of those days, he was beginning to feel a little bit better and we were having fun together playing with the camera. Most of the pictures were awful, but there was just something about this one. I’m inspired by the boy’s perseverance. If a little baby can take it and keep on rolling, so can I. A reader sent this to me this week, and it truly sums up how I feel about frugality. If I can regularly make decisions that don’t really have a big impact on me, like not buying a new game until I’ve played the ones I already have or using the library or making a meal at home, then I forego the stress and worry that comes with having difficulty paying bills or going into panic mode if my income falls. I spent a bit of time this week on the campus of Iowa State University. 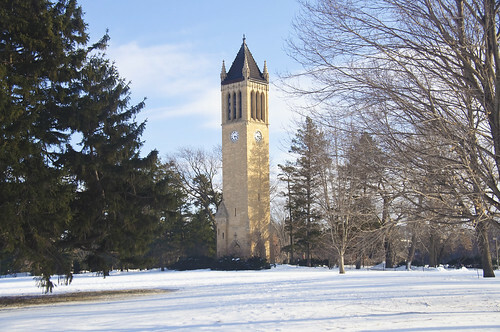 As I was walking out of the Memorial Union on campus, I saw the campanile (a large clock tower) that sits in the center of campus, shrouded in snow. It reminded me of many winters I spent in college, trudging across a freezing campus with a load of books on my back, hoping my toes didn’t freeze by the time I reached the far side. Thanks to Dirk Hansen for the image; unfortunately, I didn’t get a good one with my own camera. A couple days ago, I tried a different approach to making chili, far different than I’d done before. It involved cooking it by baking it – putting the whole pot in a 300 degree Fahrenheit oven for two hours. Not only was the chili delicious, but the aromas filled the entire house, making the whole house smell gently of delicious chiles and tomatoes. The mere thought of that aroma makes me want to experiment with our meals. We only have one life, and in that life we go through stages. We shift from one to the other, not realizing what we’ve lost until it’s too late. There is much to celebrate about where we’re at right now. Another is when I walked along Main Street in Ames, Iowa and came across a music shop. I stuck my head inside for a moment to find someone playing an amazing ragtime song on the piano, basically off the cuff without any sheet music. That’s an amazing and inspirational skill. This is a philosophy, eloquently stated, that’s beginning to shape how I parent my children. I’m happy to help them into adulthood if they’re actually chasing a dream, but if they’re just working to goof off on the weekends, I don’t have much interest in assisting that. This has been my desktop wallpaper all week long. I yearn for the return of summer. Thanks to Steve Dorrington for the image. Everyone has made mistakes in their past. While it’s good to reflect on them to help yourself to improve, you’ve always got to keep in mind that things are moving forward, not backward. The mistakes you made in the past are in the past. You have a clean slate today, one by which you can prove yourself and build up opportunities all over again. I spent a lot of this week listening to the soundtrack to the film Amadeus while I worked. This is the highlight of that soundtrack for me.